So this post was a long time coming! Something I meant to share weeks ago, but I’ve been too darn busy. Anyhoo…I’ve got an exciting review for you! After reading Choosing Raw’s write up & interview with the creator of Hampton Creek Foods, producer of the truly innovative products “Beyond Eggs” & “Just Mayo,” I was super intrigued & wanted to give it a try for myself. The only problem? It’s not available in stores yet! So I decided to reach out to them & ask if they would be interested in sending me a few samples to review for Vegenista. 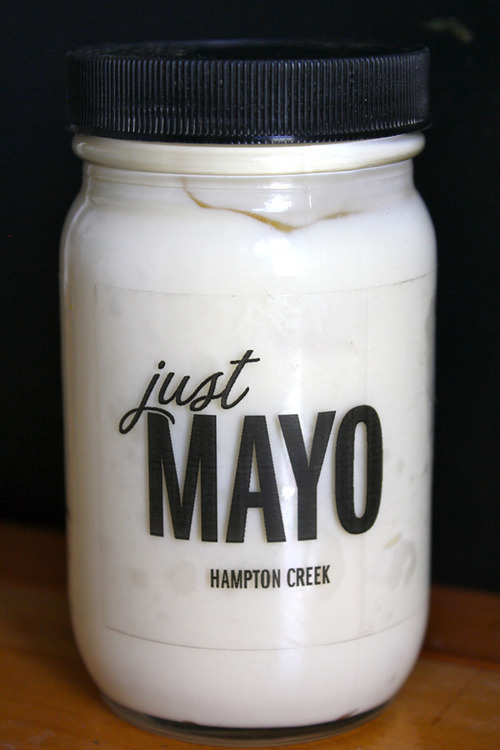 Almost immediately, the wonderful people at Hampton Creek Foods emailed back & said they’d be happy to send me “samples” right away. A few days later a large box arrived with beyond generous “samples” of their Just Mayo, Chipotle Mayo, Beyond Eggs for Cookies & a recipe book. Wow. Just. Wow. For the 1st half of this review I am going to focus on the mayo. So what’s the big idea? “Just Mayo” is a sustainable, delicious It’s a full fat mayonnaise that uses “Beyond Eggs” in place of egg yolk in the emulsification process. In addition it’s…. And…I am delighted to report….it’s good! I’ve done other reviews of vegan mayos, & i am often disappointed. Nothing ever seems to compare to everyone’s coveted Vegenaise. To my surprise, in a side by side taste test with Vegenaise, Just Mayo held it’s own. I found them to be very similar in taste & texture. The differences, Just Mayo has a slightly thinner texture, & there is the tiniest bit of sweetness in the finish. The Chipotle Mayo has a nice little kick to it, without being too spicy or over powering. It would be perfect on a vegan burger, or would make a nice zesty vegan coleslaw! It’s back to school time, which means back to work for me at my job as a Speech & Language therapist, & back to packing early morning lunches! 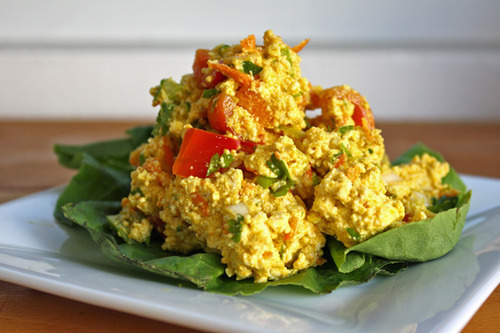 Most of the time I throw together a quick salad of fresh lettuce, veggies, legumes, avocado & homemade dressing, but sometimes I crave sandwiches too & one of my favorites Tofu “Egg” Salad. I have a few different variations that I like to play with – traditional, curried, truffled, etc. & I like to keep it served simply on ezekiel bread with lettuce & sprouts. It makes for a wonderful & satisfying lunch on the go since I am usually working at my desk, or en route to a therapy session when lunchtime rolls around! For this review I tried a spin on my more “traditional” version, using the Chipotle Mayo where I would normally use my tried & true Vegenaise. And it did not disappoint. Creamy, zesty, crunchy & delicious. This is my new fave! Crumble tofu with your hands into a large bowl. Add vegan mayo, red pepper, green onions, parsley, mustard, turmeric, salt & pepper, & mix thoroughly. 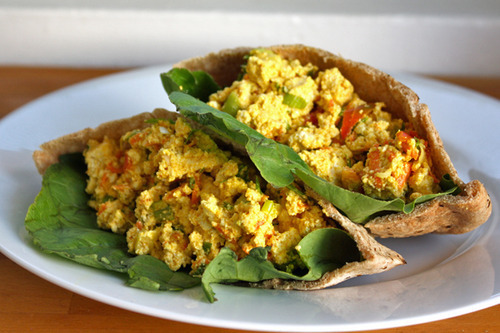 Serve in a lettuce cup, between 2 slices of sprouted whole grain bread, scooped into a pita pocket, or wrapped in a whole grain tortilla. 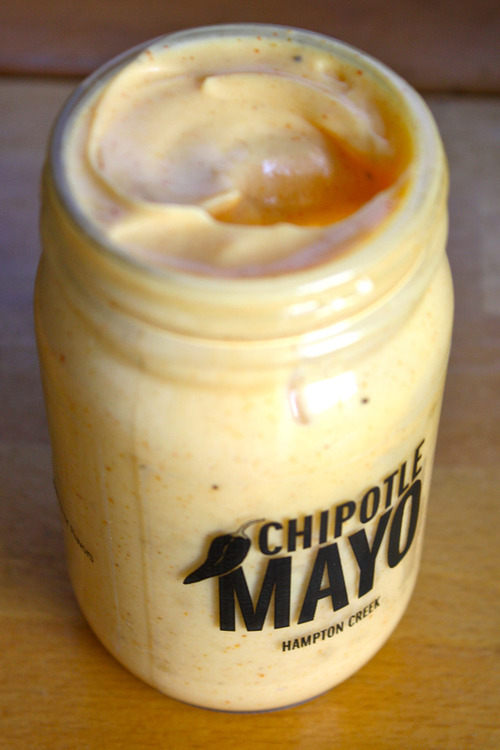 Is it bad to admit that I liked the Chipotle Mayo so much that I’ve already used the whole jar? Yep, guilty as charged. In addition to making a delightful eggless salad, the Chipotle Mayo is also wonderful on avocado toast for just an added bit of zing, as a sandwich spread of course, & even used as an aioli dip for sweet potato fries (oh yes she did!). So the question on your minds probably is…would I spend my hard earned money on a jar of this stuff? Why, yes, yes I would. Absolutely! So when can you grab a jar of this for yourselves? Soon, I hope! 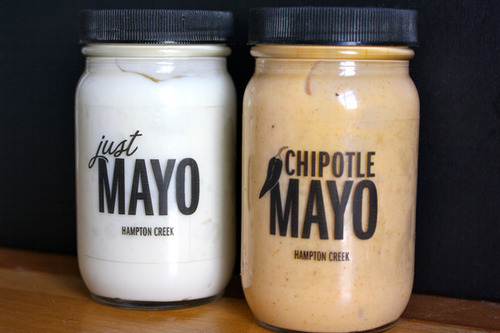 In the meantime, you can ask for Just Mayo at the prepared foods/deli section of your local Whole Foods which will help increase demand so that Hampton Creek Foods products can get their products into stores & on to shelves faster. This is a company to keep an eye on friends. They are doing some exciting things, so be sure to check out their website, & connect with them on Facebook, & Twitter. And stay tuned for a “Beyond Eggs for Cookies” review in the very near future. Now that the temperature has cooled down enough for me to turn on my oven, it’s time to bake some cookies! Review Disclaimer: These products were sent to me free of charge for editorial review. All opinions are my own.